#AFPCongress @tedhart "giving to a great cause is an investment"
#afpcongress prime data's giving away$8500 in free fundraising services - what story will help you win? Stop by the @team_ajah booth at #afpcongress for your chance to win champagne and chocolate! 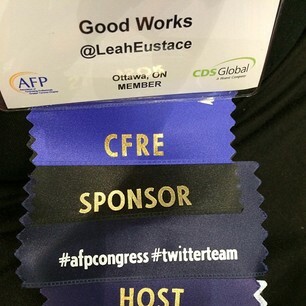 If you work in the #nonprofit sector, make sure you have a look at the #AFPCongress hashtag. A ton of awesome and thought-provoking info! “@afptoronto : Stop by the @team_ajah booth at #afpcongress for your chance to win champagne and chocolate!” YES! #AFPCongress @aclaytonaction focus on making your donor feel great! !